For as long as workplace satire has existed on television and in the movies, cubicles have gotten a bad name. What once was a visionary idea from leading workspace designers Herman Miller has now become synonymous with the drudgery of daily office life. Ask any young professional to come up with synonyms for “cubicle” and you’ll probably get a litany of negative equivalents. But here’s the deal – more and more research is showing that the happiest employees are the ones who work in cubicles. Yes, we know such a sentiment goes against the commonly held beliefs of the collaborative powers of an open office. If Google, Facebook and just about every other tech startup use open-office floorplans, how, in the name of workplace collaboration, could cubicles be the right way to do things? 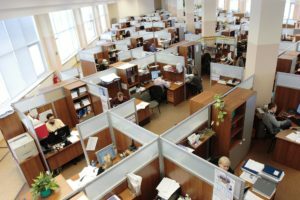 We think research shows that cubicles have three specific advantages over an open-office floorplan, all of which we’ll cover in this post. Let’s think about the open-office philosophy for a moment. Companies have shunned cubicles in favor of an open floor plan because it promotes collaboration and transparency. You’re removed from a private space and placed in a communal atmosphere. In theory, this sounds like an excellent idea. But, consider this. When you opt for an open office, you’re sacrificing your privacy for the good of the group. Without getting too philosophical, think about how this affects your self-expression and privacy. You lose it, right? You no longer have a space you can call yours, a space that’s shielded from coworkers and bosses. You’ve given that up for the sake of the company’s identity and culture. We’re all for company culture – it’s a hallmark of the new workplace revolution. However, we think employees lose out when company culture requires them to surrender their personal space for an open floorplan. While it might sound appealing to tackle your checklist while sitting in an overstuffed bean-bag chair, the fact that another employee is doing the same thing just inches away on a picnic table does something to your mind. You see, our minds can be more productive when they sense they’re in a private space. According to a 2014 article from the New York Times, researchers found architectural privacy has a direct effect on psychological privacy, which in turn increases workplace and occupational satisfaction. Think of it in terms of working at home. If you set up your laptop in your living room, you’ll be at the mercy of distractions and sound pollution that will stymie your creativity. Kids playing with your mouse. TVs blaring. Babies crying. But if you can steal away to an office space for an hour, you have the quietness and anonymity you need to generate ideas and focus. In fact, a 2017 BBC article notes that we’re 15% less productive in open-office environments and the small distractions that are more frequent in these environments cost us up to 20 minutes per distraction. A 2016 article from Forbes points out that one landmark study showed that workers’ biggest complaint about open offices is noise, as more than 1 out of 4 respondents said they were unsatisfied with noise levels in their workplace. Cubicles shield out much of the noise from coworkers and restrict the sound levels of your conversations, whether they’re sales calls or confidential conversations. They also shield you from the stress that comes from having to focus on your work while the noise of your coworkers’ tasks spills into your desk area. Our line of simple desk dividers and panels can reduce noise pollution, increase privacy and boost productivity. Stop by our Products page to get a sense of what we can offer, then give us a call at 888-323-6986.